Tiger Farming - Let's stop the murdering of tigers globally! "Born Free is wholly opposed to ‘tiger farming’, or the large scale captive breeding of tigers for commercial gain, believing it causes great suffering and leads to the poaching and trafficking of wild tigers, thus undermining critical conservation efforts." 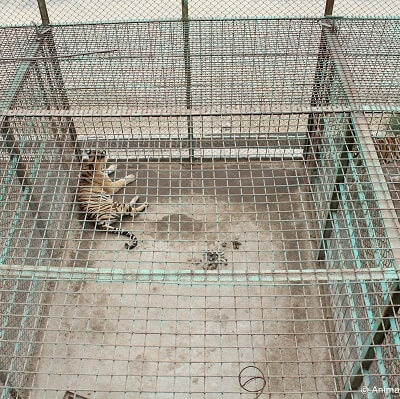 Tigers are bred and kept in often appalling conditions on ‘tiger farms’ and in other facilities across Asia in order to supply the trade in their ‘parts and products’. 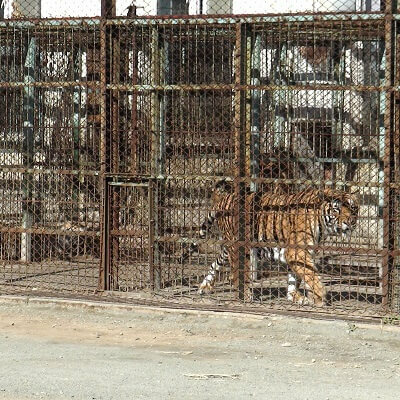 Tiger farms can house hundreds of tigers in row upon row of barren and cramped enclosures. Many of these facilities have been implicated in illegal trade. Skins from farmed tigers are professionally taxidermied and turned into rugs for luxury home décor; skeletons are soaked in vats of wine to make tiger bone ‘health tonic’; teeth, claws and other body parts are also in demand. Healthy markets for such items are found in China, Indonesia, Lao PDR, Myanmar and Viet Nam, and are openly sold in a number of locations in these countries. A total ban on the international trade in tiger parts and products was put in place in 1975, but tigers from captive sources, as well as wild tigers, are routinely identified in illegal cross-border trade. In 2007, all countries concerned agreed to not breed tigers for trade, and yet the tiger farming industry has now developed to such a point that the number of captive tigers in such facilities vastly outnumbers that of their wild counterparts. While the world has less than 4,000 wild tigers, just four countries - China, Thailand, Viet Nam and Lao PDR - have an estimated 7,000-8,000 captive tigers. Considerable numbers of tigers are also bred in South Africa, which has no wild tigers, and exported to Asia. Not only do tiger farms present serious welfare problems but they are also a serious additional obstacle to wild tiger conservation, further stimulating demand for wild tiger parts and products, which in turn actively stimulates the demand for their more ‘potent’ and often cheaper counterparts from the wild. As with moon bears and other farmed endangered animals, the creation of a captive industry to supply a market has failed to alleviate poaching pressure on wild tigers. On the contrary, this has only further encouraged the development of a market which often perceives the wild counterpart as more powerful, virile or otherwise more desirable. An industry thriving on encouraging demand for gruesome potions, decorations and amulets is the last thing wild tigers need. Tiger poaching, conflict with people over shared resources, degraded habitat from large scale developments, loss of prey due to poaching…these have all led to a situation where 60% of the world’s few wild tigers persist in just one country (India), which as the largest source of wild tigers to the nearest source of demand, faces an acute and ongoing poaching threat. Officially, a handful of wild tigers remain in China, and have been declared ‘functionally extinct’ in Cambodia, Vietnam and Laos. Many countries with wild tiger populations are devoting considerable resources to address falling tiger numbers, or to increase their populations, but all these efforts will continue to be undermined, and wild tigers will continue to be threatened, so long as tiger faming exists. 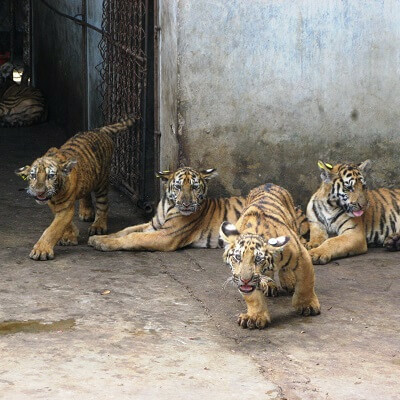 Sign our petition calling on all countries to improve enforcement of the ban on international trade in tiger parts and products, and to close down all tiger farms and other facilities breeding tigers for trade. Become a Born Free supporter to help fund our vital work to end the cruel practice of tiger farming and to Keep Wildlife in the Wild. Born Free is wholly opposed to tiger farming. If you agree, please help spread the word by sharing our petitions and statements with your family and friends.